These 20" long Panel Saws are the perfect size for a cabinetmaker dimensioning material at the bench. The Swedish Steel blade is taper ground to help prevent binding in the cut. Curly Maple handles, solid Brass fittings. Nice weight and balance. Taper ground blade: .030" to .026" thick, with a .005" set. Filed crosscut at 8 ppi and 12 ppi. Sawbenches are helpful when using a Panel Saw. 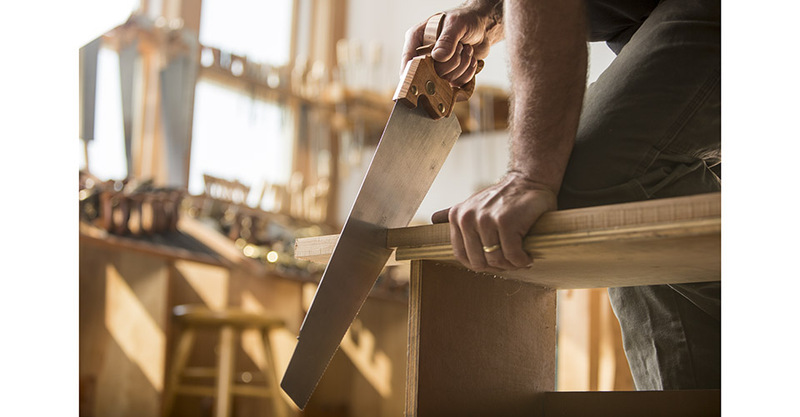 For an article on sawbenches by Christopher Schwarz, the former Editor of Popular Woodworking Magazine, click here. The first thing you’ll need to know about your saw is how to hold it. This may seem obvious, but many people try to wrap all four fingers around the handle. The proper grip is to wrap the middle, ring, and little fingers around the handle with the forefinger pointing along the spine of the saw plate. You’ll discover that in doing so, you will have much better control over how your saw tracks, and it will also feel very comfortable and natural. Your saw is very sharp when it arrives. Best performance is obtained by sawing slowly and evenly with very little downward pressure, using as much of the blade as possible. Your saw will track right to the line. Be aware, however, that due to the slight set, your saw will be hard to correct if it starts to cut away from the line. If that happens, it’s because you didn’t line it up properly when you started. Panel Saw handles use conventional bolts and slotted nuts, and the screwdrivers designed to fit our saw nuts (No. 3) are available from us. The steel in your saw's blade is the best that's available. It is very hard (50-52R) and will stay sharp a long time. Eventually, however, you'll have to sharpen it. You can do this easily yourself with a little practice. We use a 7" slim taper file to file the teeth on our 7ppi Rip Panel Saw, a 6" slim taper file to file the teeth on our 8ppi Crosscut Panel Saw, and a 5" double extra slim taper file to file the teeth on our 12ppi Crosscut Saw. Take a couple of pieces of thin, straight scrap and clamp them in your vise on either side of the blade so that the top of the scrap is flush with the bottom of the gullets on the teeth. Take your file and take one swipe per tooth. Notice the small groove the file leaves in the wood. This is a good gauge to show you how deep you're filing. If you use this method consistently, you shouldn't ever have to joint your saw. You can use a Stanley 42X saw set on our saws. 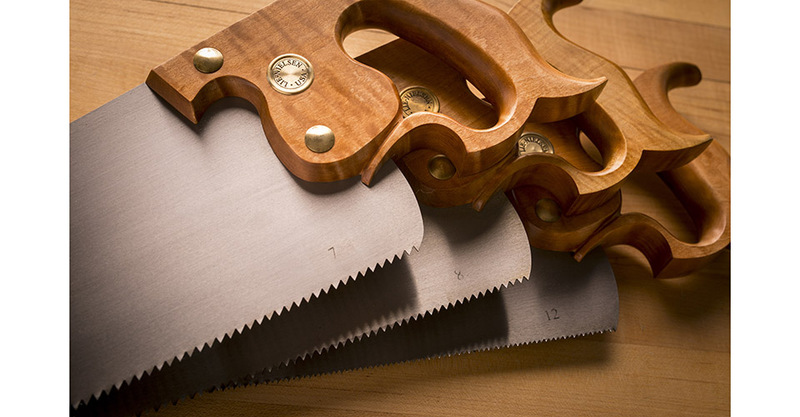 The Stanley set may vary from ours, so experiment on a small area before you do the whole saw. Your Panel Saws only needs approximately .005" of set per side when properly set. The slight set is what makes the saw cut and track so well. If done improperly, you'll notice a drastic decrease in performance. You should only have to reset your blade after every other sharpening, not every time. 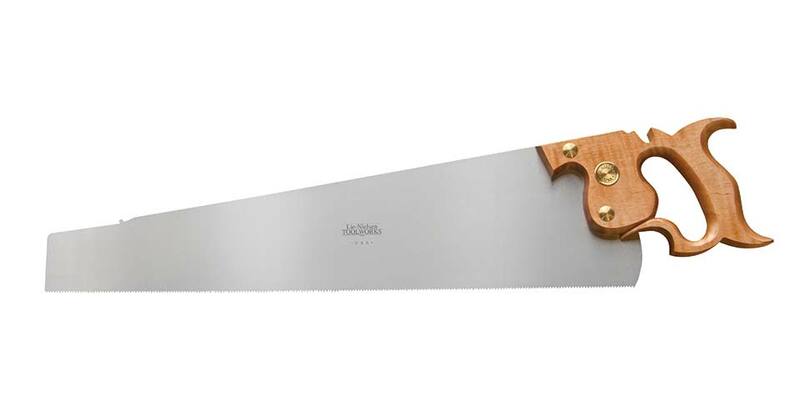 Quality Swedish Steel blade, Curly Maple handle and traditional Brass saw nuts and bolts.